the end at the Johnson GEO CENTRE! We can see much from the surface of our planet, but can we learn more about the Earth from space? Visit the Johnson GEO CENTRE’s Our Future & Space exhibit to discover the answer. Learn how we use satellites to image our planet, and how this data can monitor environmental changes and the planet’s natural resources. Learn more about Canada’s role in space exploration, and see a large-scale model of the Canadarm 2. Learn about meteorite impacts in our own backyard, and the research that is being conducted on other planets like Mars. And that’s just the beginning! 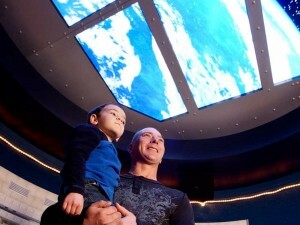 Find out the latest developments in astronomy, and space exploration, at the Johnson GEO CENTRE’s Our Future & Space.